Are you ready to propose to that special someone? Congrats! This is the start of an exciting journey for you and your sweetie and we want to help you save as much money as possible. Engagement rings are not cheap! But before you pop out your wallet and pop the question, find out the best time of year to buy an engagement ring, so you can save thousands and maybe put the savings towards a fun honeymoon. Engagement season is a peak time from Thanksgiving to Valentine’s Day where many proposals take place, therefore, the demand for engagement rings is higher during this time and jewelers take advantage by raising prices. Maybe it’s because of the holidays or the time spent with family, or maybe it’s just the perfect time for a proposal, anyway, this is the time of year when engagement rings are flying out of the display cases. You may be thinking, “Wait; but jewelers always have those sales during the holidays so aren’t the rings less expensive?” Sorry, but this isn’t true 🙁 . Although jewelers do have sales during engagement season, this is only because they’ve hiked the prices up even more and then have a “sale” to make it seem like you’re getting a good deal. The best time to purchase an engagement ring is between June and August since this is typically known as wedding season. (Yes, we know engagement season and wedding season aren’t among the four seasons you typically think of but hang in there, we’ll explain!) Many couples get married during the summer months known as wedding season. Summer is typically slow (in regards to selling engagement rings) for jewelers and online engagement ring sellers, therefore the engagement ring prices are typically more flexible since they are trying to push inventory out the door. Also, prices for engagement rings are much lower during wedding season and often times jewelers have sales. 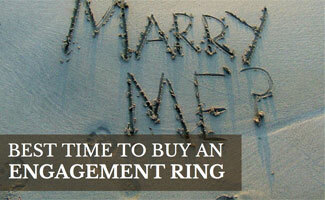 Check out this video from Raymond Lee Jewelers for tips on when you should buy an engagement ring. When are you planning on popping the question? Weddings and engagement seasons? haha! I guess it makes sense that engagement rings cost less when less people are getting engaged, and here I was thinking that anytime was a good time to buy a ring. Will keep this in mind and think about holding off to buy my honey her ring so I can save some cash money.